What happens when I cancel an order? As of MageRewards 1.7.2.0, if you are canceling an order using Magento's default Credit Memo method, MageRewards allows you to adjust the points spent/earned. How do I adjust points when an order is cancelled? Once admin decides to cancel the order from Sales >> Order, you will notice a pop up to Adjust Points with Points Earned and Spent values. 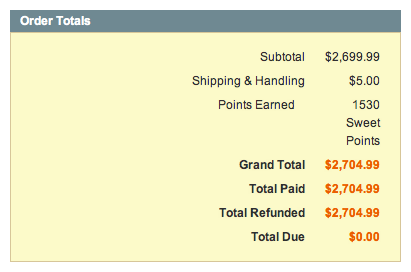 The values you see represent the amount of points earned/spent on this order by the customer. Setting any of these values to 0 will cancel / revoke the point transfers (depending if the points were already approved or not). You can also set any amount and MageRewards will intelligently create / cancel / revoke point transfers to satisfy these points amounts. Then click on Cancel Order Button. How do I adjust points when creating a Credit Memo? Navigate to Sales > Orders. Click on the order you want to create a Credit Memo for. 3. Click on the orange Credit Memo button. 4. 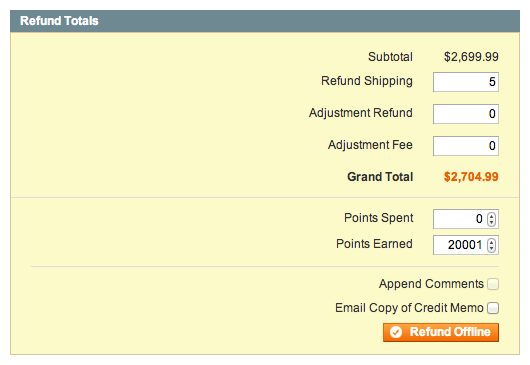 In the Refund Totals box, you'll see a row for Points Earned and Points Spent. 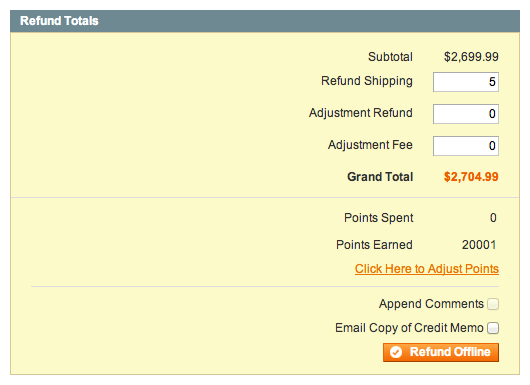 If you want to refund or revoke these points, you'll need to click Click Here to Adjust Points. 5. Adjust the points earned and/or spent along with the other information you need to set for your credit memo and then click the orange Refund Offline button. 6. Your credit memo is now complete. If you scroll down you'll see any adjusted points earned or spent as well. What happens if an order fails at checkout or payment? As of MageRewards 1.7.5.0, if a payment fails during checkout (through PayPal, Authorize.net, etc), the points transfer will automatically cancel if you have configured this setting. To use this setting, navigate to Rewards > Configuration > Other Configuration and expand the Order Fulfillment area. Set Automatically Remove Points for Failed Checkout and Mass Transfers to Yes. NOTE: This setting will also automatically cancel all point transfers associated to orders when the administrator creates a mass order cancel operation. In Magento 1.4.0.0 & Magento 1.4.0.1, it isn't possible to display the points adjuster popup. This is because we are injecting the code for the popup on event core_block_abstract_to_html_after and although the event exists, the transport object is not included in the dispatch. Because of this, in MageRewards 1.7.5.0, we adjusted this feature to automatically cancel points in Magento 1.4.0.0 and Magento 1.4.0.1. If you are running a previous release of MageRewards previous to 1.7.2.0, a cancelled order will cancel the associated points transfers as well.